I recently had a chance to meet up with an old colleague and friend of mine, Paul Muckerheide, who owns and operates a business that restores and protects hard surfaces, such as glass, stone, porcelain, and ceramic tile. His company’s name is Granite State HydroShield, LLC and he is located in Hampstead New Hampshire, though he does business statewide. Core to Granite State HydroShield’s business is the application of a non-stick protective coating called HydroShield that is applied to hard surfaces such as granite/stone countertops, interior and exterior glass, and tile and grout. Paul explained to me that HydroShield is a protective coating product that has been around for over 20 years, and that unlike other hard surface sealants, HydroShield is not a film that will discolor, chip or peel. On the contrary, it is a sealant that works by changing the molecular structure of the hard glass or stone surface. As he described to me, it specifically does this by replacing the Oxygen molecules within the surface of the glass or stone with Carbon molecules. The result, a finished surface that is extremely smooth, and that causes water to bead up and roll off. Consequently, the net effect is the surfaces stay cleaner, and are protected from hard water damage and staining. Moreover, the surfaces are actually strengthened, and made less susceptible to scratching and abrasion, due to the Carbon molecules. Paul demonstrated HydroShield for me and the results were impressive. On stone countertop samples, where half the samples’ finished surfaces were protected with HydroShield, he placed the samples flat on my garage work bench and sprayed water onto their finished surfaces. On the finished sides that were coated with the invisible HydroShield, the water instantly beaded up into hundreds of small water droplets. And on the non-treated sides, the water congregated into large puddles. When he picked the stone samples up and tilted them, the water beads on the HydroShield protected sides instantly slid off the finished surfaces. On the non-treated sides, the larger water puddles lingered momentarily before eventually slipping off, but even then, there were residual water droplets that continued to cling to the stone surface. Observing the lingering water droplets on the non-HydroShield coated sides reminded me of what I typically see on my glass shower doors after taking a shower, rivulets of water droplets clinging to the shower glass and slowly dripping downward towards the shower floor. If I didn’t take the time to squeegee down the glass doors after each shower, those rivulets of water would inevitably leave dried water streaks and stains on the shower glass. Paul also explained that besides restoring and protecting hard surfaces in the home, HydroShield is also helpful for protecting, strengthening and reducing cleaning maintenance on exterior window glass surfaces. Again, due to replacing the Oxygen molecules within the surface of the glass with Carbon molecules, HydroShield helps the exterior window glass stay cleaner longer, and when cleaning is necessary, make it a much simpler and easier task to do. Paul also mentioned, that due to the fact that the cleaning of hard surfaces coated in HydroShield is much easier, abrasive and toxic cleaners are not required, which is not only good for the hard surfaces, but also the environment. I asked him about warranties, and the frequency of re-applications. 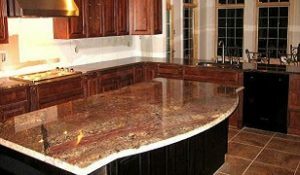 He indicated that for most granite stone, there is a 15 year warranty, and for all other stones and porous granites a 3 year warranty. And in regards to shower glass surfaces, HydroShield is warrantied for 5 years. So if you live in the greater New Hampshire area and want to protect and/or restore your home’s hard surfaces, I suggest visiting Granite State HydroShield’s website and giving Paul a call. And for folks who don’t live in the New Hampshire area, do an internet search for HydroShield to find a company in your area that can offer this same service and product.